How to Eat an Elephant This metaphor is widely used as a problem solving technique and the answer, of course, is ‘One bite at a time’. We all know the saying, but we don’t always succeed when applying this to our lives. Simply put, it means if you have what seems like an insurmountable problem, approach it one small step at a time and eventually you will reach a conclusion. You will have managed to eat the whole elephant. Elephants come in all shapes and sizes. What seems to be the size of a mouse to some, can seem more like an elephant to others. Changing your diet is hard enough for anyone, without the additional weight of being told that it could help cure your disease. This is the case for some people with severe digestive disorders, and is without a doubt an elephantine task. So where does one start? The first step is to make sure that we are prepared for the colossal task. As one might expect, due to a daunting realization of never having actually eaten an elephant before, we are bound to come across a few surprises along the way. 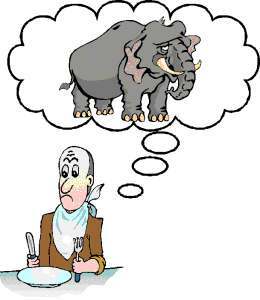 In the case of eating an elephant, the research is pretty much non-existent. Nobody has actually eaten one. One man, Fifty-six-year-old Michael Lotito of Villars de Lans, France (also known as Monsieur Mangetout), or “Mr. Eat-It-All”. For reasons unclear, he began eating small amounts of glass and metal at age nine. Over the course of his lifetime, he has consumed seven television sets, six chandeliers, a computer, 18 bicycles, 15 supermarket carts, two beds, a pair of skis, a coffin, and a Cessna airplane. He is able to eat up to two pounds of metal per day, has regular bowel movements, and has never had any serious stomach problems. It should be noted however that recent x-rays discovered a chain and several other pieces of metal still working their way through his digestive system. I think I would rather eat an elephant! Now let us get to the real issue. To cure our digestive disease, we need to begin with changing our diet. This is our ‘elephant’. The things we know empower us, but the things we do not know discourage us. So it is important to gain some extra knowledge by finding the answers to the things we do not know. And remember, life is a journey, not a destination! Whether you are on medication or not, changing your diet will help. To prepare for this change in diet you will first need to read ‘Breaking the Vicious Cycle (BTVC)’ by Elaine Gottschall and visit the official website for more information. It is important to gain knowledge about the Specific Carbohydrate Diet (SCD) and read about the successes and about the problems people have encountered. There are some great websites that will give you thorough insight. To find these websites, click on this link (CCCCIBS). Preparation includes talking to your family that there might be some changes in the menu – show them the ‘Healing Foods’ cookbook. It tends to ease any despair that your family might feel, as the recipes look and sound so delicious. Then go through your food cupboard and start eliminating all the foods with illegal/unhealthy ingredients in them. Print out the legal/illegal food list from the BTVC website. Then download the Four Day Intro Diet from here (CCCCIBS). Judging by the hundreds of emails I receive, the consensus is that the foods allowed on the SCD are delicious. And why shouldn’t they be, as they are just everyday normal foods. The other reason is that you have eliminated all the foods that can make you feel bloated and heavy. Also, I could imagine that if you were actually eating an elephant it probably tastes like chicken. Yum. As long as you can cook and eat, you can do it! Thousands have made it (not eating elephants, of course) and when you get to read some of the forums on SCD you will see this for yourself. I recommend you check out the Yahoo! BTVC/SCD group. This is tough, because it takes 110% adherence to the diet to be successful. Mostly the diet begins as an elimination diet. We start off with the intro part and for some even this has to be more restrictive. Each person has different allergies; some might find that after only two weeks the difference to their health is amazing. For some it can take several months. It took a whole year before I reached the final stage of the diet. Most of you will find the difference is noticeable within the first few days, the tough bit is to keep at it 110%. If you give up you will have to continue your medical treatment. This is limited as research and progress for finding the on- pill-fix, is just not available. You will need assistance from a trained professional who supports the notion that diet plays an important part in healing the gut. Find someone; look for this person via the websites I have pointed out. But unlike elephants, there is no use by date. You can always start again. In the case of eating an elephant,this would be the part where I tell you of the large refrigeration you will need. However, in the case of the SCD and your health, once again a vital tool is that of your chosen trained professional. I suggest a bio-medical doctor. This is someone who understands that health and healing requires a multifaceted approach. Also check out the practitioners’ reviews on our website (CCCCIBS). On a practical level you will need the usual kitchen implements, the ‘Healing Foods’ cookbook and not to forget all the other SCD cookbooks which are available through Amazon. Most of all you will need to stay motivated and determined to beat ‘this thing’. Be organized; cook in advance and keep informed via our Blog. There we offer new recipes, and keep you informed on new developments. And, before I forget, elephants are legal on the Specific Carbohydrate Diet. Enjoy the many little (or large) bites along the way, as they are the building blocks of your journey!